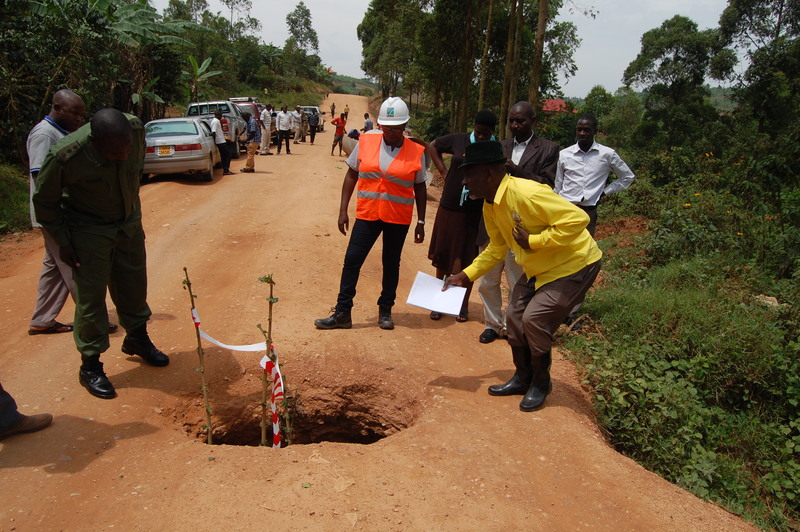 MBARARA – The local authorities of the affected sub-counties on Kabwohe-Kitagata-Mitooma-Rukungiri stretch have queried the quality of murum being used saying it is substandard to ease transport especially in rainy seasons. This was raised during the road inspection that was led by Uganda National Roads Authority Regional Manager Southwestern Bennice Kiganda, station Engineer for Mbarara one Jacob and Ruhinda County Mp Capt. Dononzio Kahonda. The inspection, according to Kahonda came as a result of the many complaints that were raised from the public concerning the murum adding that the contractor—Rodo Contractors limited is not putting access roads. The culverts being used are also of poor quality, and some have already sunk creating deep potholes within the middle of the road. “We received complaints from the community and local leaders on how the construction on this stretch is being done, we did not sit I had to engage the project managers (UNRA) to ensure that we get time to inspect what the contractor is doing, indeed physically the type of marrum being used is substandard and there are no access roads, we found out very many spots that are supposed to be redone where some deep holes have emerged within the middle of the road, there is shoddy work but project managers have assured us that they are going to repeat some of these spots, this Kisanja Hakuna Mchezo, more so the bridges are very narrow in a sense that two cars cannot bypass the other and this for the Directorate of Bridge construction and am to make a report to them,” Kahondo said. According to reports, this stretch of 65km from Kabwohe-Kitagata-Mitooma-Rukungiri road was contracted at a whopping sum of sh.4.18bn for a period of three years since 2015 only to do routine upgrading and was contracted to Rodo contractors Limited. Bennice Kiganda, the Regional Manager UNRA Southwestern region arrayed the fears about the quality of marrum, saying that this type was tested and verified to be the best on this road in the government laboratories; she only said that some of the deep holes were caused by heavy rains. “Visually the marrum is better than what they think can work, this is a stretch of 65 km and the contractor is doing his best because is above the schedule we hope by early January this year he will be done because every project is above 85%, where this marrum fails to work well I assure you we shall redo the work and let this information reach the locals on ground. Kiganda assured.